Ask any Millennial or Gen Z-er to give you a social media faux pas, and they might say constantly finding yourself in heated Facebook political rants or double posting on the same day to Instagram. These social media don’ts change more often than Facebook’s privacy policies, and it can be a lot for any marketing team to keep track of — especially if they’re not equipped with members of their target demographic on their team. However, your business shouldn’t use social media as the only way to reach those 25 and under. In 2017, 81 percent of the entire U.S. population had at least one social media profile. There is no excuse for not investing in social media as part of a larger content marketing strategy. Social Media Marketing (SMM) gets your brand involved in relevant industry conversations through social trends. It allows you to take note of what questions people are asking about and within your industry. And it’s also the gateway to a better, more human, marketing strategy; you’re getting prime access to potential customers saying what they want on a platform where you can talk about how your brand addresses their needs. Maybe those questions could best be answered in a simple Facebook live video, or maybe you can showcase a cool feature of your company in a series of step-by-step videos done via Instagram Stories or Snapchat. 1. Not taking social media seriously. In 2015, Facebook helped sway 52 percent of consumer’s online and offline purchasing. That number continues to rise — and that’s just one social media platform. 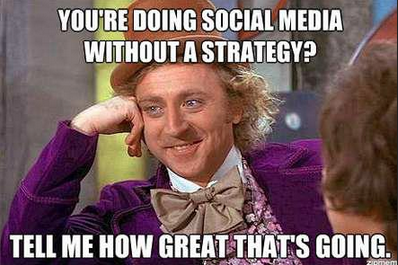 Your content marketing strategy needs social media. It doesn’t matter if you run a non-profit organization, a startup out of your garage, or an enterprise team. If you’re not maintaining a social media presence or think that it’s a dying fad, then you’re making a mistake that could be costing your company sales. There’s also a misunderstanding that your social media marketer sits and scrolls through Twitter to find clever hashtags and toss in well-timed gifs. But — as one of the most customer-facing elements to your content marketing strategy — the work of your SM marketer is considerably bigger than making company memes. Invest in a social media strategy, even if it’s something as simple as using an autoposting tool like Buffer to automate your social media strategy. If you’re willing to go deeper, bring on a social media marketer who understands engagement metrics and can maintain a healthy social presence on a variety of platforms. The ones that think they need to write a thesis statement in each carefully crafted tweet. The ones that will hashtag #every. #single. #word. But the key to social media success for your brand is to be social. Be conversational with you brand voice and tone. Type your social media content with your end reader in mind. Make the content relevant and engaging. And at the very least, write sentences that wouldn’t bore the average social media user. But unless you are a major brand with billions in global revenue, we highly suggest being careful when dishing out the snark or getting sassy — especially in dealing with customers. You don’t have to get into a comments war about a particular topic, but you can direct message a concerned or disappointed customer in a respectful manner through things like Facebook Messenger. 1.Did this user leave threatening, abusive, or offensive language intending too harm another user? If that answer is yes, then feel free to delete the comment. Having a business social media account allow for hate speech or threatening language will do far more harm than good. They might be lashing out after a poor customer service interaction on your company’s end, or your business might have failed to deliver on this customer’s expectation. One of the safest things to do is to write up one of your best “customer service voice” moments, apologize for the inconvenience (even if it was actually their fault), and comment that a representative from your team will be reaching out to them to solve the issue. 3. Are they just being a troll and hating on your product? Don’t feed the hate monster. More often than not, fans of your company will step in on your behalf and send the troll back under its bridge. And then there’s the complete opposite of the previous sin. Some companies are so terrified of dealing with their customers and answering hard questions about their business that they avoid the comments section all together. Running away from customer complaints and valid criticisms show a lack of customer service skills. It shows the commenter (who might genuinely want to engage with your organization again) that you don’t really care about them. Silence regarding comments and questions also implies to other followers that you’re either 1) not using social media frequently enough to check the comments or 2) avoiding conflict all together or 3) not willing to answer important customer concerns. See Subsection 2 from Number 3. If you’re considering paying ‘like factories’ to engage with your content and inflate your numbers, step away from the keyboard. If you want your posts to go viral rather than offer your followers helpful insights, take a second and rethink why you started. The ultimate goal for every element of content marketing — social media included — is to engage with an audience of potential buyers or current product users. While it can be a great hit of dopamine to see your follower account increase, it’s meaningless unless those new followers actually engage with your brand. Seek out conversations with those who engage with your content. It doesn’t initially have to be with your product, but discussions should ideally be based within your industry. For example, if you’re a healthcare provider, have a discussion with your followers about what questions they have about applying for insurance. Yes, we know you want to trend on social media. And we totally understand wanting to tweet about #WorldPenguinDay on Twitter from the agency account. However, social media is still content. While those fun tweets have a place and time, they shouldn’t constitute the majority of your social media posts. A massive mistake SMBs and fledgling social media marketing groups often make is not having any semblance of a strategy. For example, if your business has 2K+ Tweets but only 500 followers and gets a retweet or comment maybe once a week then it’s clear you either don’t have a strategy or you aren’t promoting content your followers want to engage with. Check to make sure you have clear ways to access your social media accounts from your business website, blog or newsletter. Give people an incentive to follow your accounts. For example, offer social media followers exclusive savings or tips not found anywhere else on your site. At the very least, make sure almost every social media post offers something to those who see it. Offer your best tips, tricks, and industry insights to those who follow along as a thank you for engaging with your brand. Encourage people to engage with your organization by giving them reasons to share your message with their followers. Unfortunately, they won’t always do that with a rogue #WorldPenguinDay tweet. Twitter is not Facebook, Facebook is not LinkedIn, and LinkedIn certainly isn’t Instagram. And yet some social media teams think that they can copy and paste each post across all their platforms. The demographic differences between users in each platform alone should give a social media user pause. Twitter: 37 percent of Twitter users are between 18 and 29. Facebook: 88 percent of 18–29 year olds use Facebook, but there’s a growing Facebook usage among those 65 and older. Instagram: 59 percent of 18–29 year olds use Instagram. That’s nearly double the next highest age sector. LinkedIn: 34 percent of 18–29 year olds use LinkedIn, only slightly edging out the 33 percent of 30–49 year olds who also use the service. Snapchat: 85 percent of Snapchat’s users are between 18 and 34. It’s safe to say that if your Facebook posts contain the same trending hashtags as what you put on Twitter, you’re doing it wrong. If you struggle with creating unique content that best fits the style of each platform, restrict your messaging to just one or two social media outlets that most of your target demographic would use. You don’t have to have an iron in every proverbial social media fire. Need other digital marketing solutions? Contact our team and we’ll get started! Want to learn more about how to enhance other elements of your site? Check out the Solodev web design blog. You’ll find attractive code tutorials and other marketing/SEO tips. Shelby Rogers serves as the Content Marketing Strategist for DigitalUs as well as Solodev, a content management system company. For more marketing insights, follow Shelby on Twitter at @shelby_rogers.